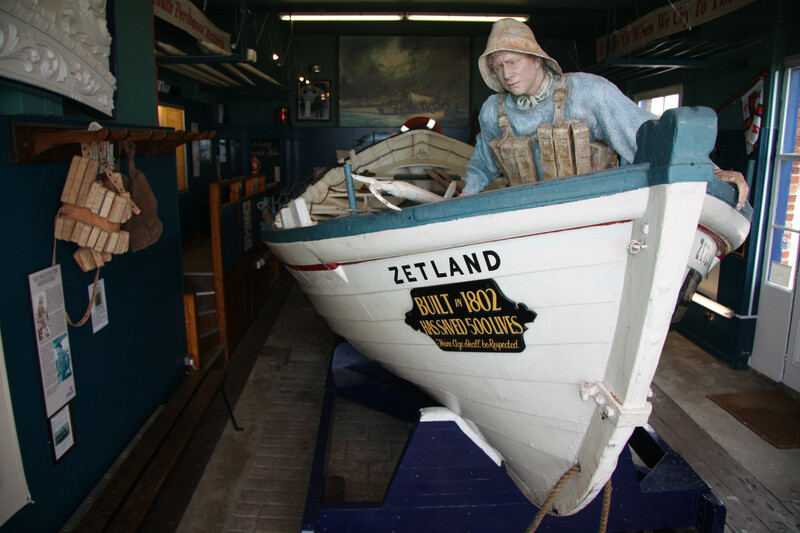 ZETLAND is the world’s oldest existing lifeboat and sole survivor of the 31 lifeboats designed and built by Henry Greathead. There remains some confusion over who designed the first lifeboat, but Greathead was awarded the ‘prize’ for ORIGINAL in 1790, and then built 30 more, ZETLAND being No 11. The funds to build her (£200) were raised by local fisher-folk with the assistance of Lord Dundas and the Reverend Y Williamson. ZETLAND was stationed at Redcar on 7 October 1802 and christened in honour of the Lord of the Manor. She saw 78 years of service and saved over 500 lives. ZETLAND is clinker built of larch planking on oak frames. The forward and aft quarters of the boat are identical in construction, giving a classic ‘double-ender’ structure. A wooden rocker keel is protected by a ferrous metal keel-band fitted from stem to stern. There are six thwarts, supported at their centre by turned wooden stanchions. The bulwarks form the outer sides of built-in ‘water-tight’ compartments that are an intrinsic part of the structure. The extreme hull shape and her clinker construction would require very wide boards if finished in single lengths, so the strakes are formed of varying planks of wood scarped together. The hull is copper nail and rove fastened and has therefore largely not been affected by wood metal reaction. 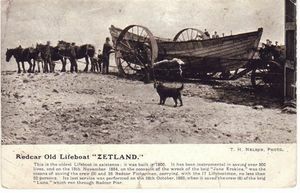 In 1858, the RNLI took over ZETLAND from the Teesbay Lifeboat and Shipwreck Society. They maintained her until September 1864 when a new boat RNLI CROSSLEY was launched at Redcar. ZETLAND was hauled to the beach and an RNLI joiner was ordered to destroy her. However, the town folk resented this and it was arranged that Redcar could keep the boat as long as she did not compete with CROSSLEY. Sufficient funds (£100) were raised for her repair at South Shields in 1872. 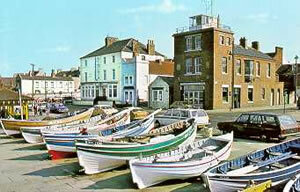 A lifeboat rowing race of four boats was held which ZETLAND won. During the intervening years her humanitarian work continued, culminating in the rescue of the brig LUNA in 1880 when on the 28th and 29th October, a severe gale disturbed Redcar. The RNLI BURTON ON TRENT (which had replaced CROSSLEY in July 1987) and the Free Gardners EMMA returned to shore after having rescued 12 crew in total from two different vessels when another sign of distress was exhibited. The Brig LUNA had drifted towards Redcar Pier. ZETLAND was made ready but had not launched before the LUNA had crashed through the Pier dividing in two. ZETLAND managed to save all seven of the crew and for this deed the RNLI awarded £100 to the RNLI crew. Being homeless, a brick shed was built for ZETLAND at the end of Granville Terrace and she was then used for salvage and other odd jobs. Eventually Lord Zetland gave her refuge in a barn at Marske. In 1905, a representative body was formed by local fishermen and the lifeboat committee and over £280 was collected to buy the Free Gardeners lifeboat house (formerly housing EMMA). ZETLAND was moved there and handed over the Redcar Borough Council. On 20 March 1907, the boathouse was opened for public inspection. ZETLAND was later closed away from public eyes for 17 years during and after the Second World War until the Redcar Ladies Lifeboat Guild opened the Free Gardeners Lifeboat House. From 1957 to 1960, the interior remained the same until the Council finally made some improvements and alterations. 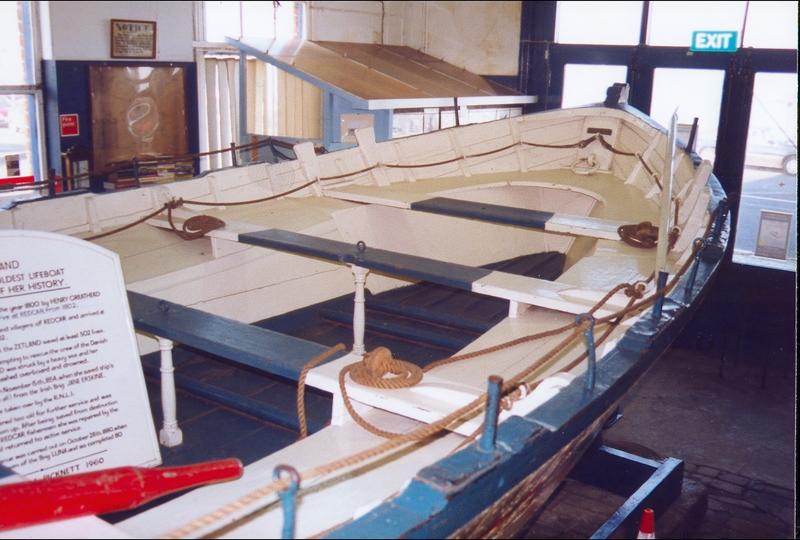 In May 1963, ZETLAND undertook a long journey to Edinburgh to be the centerpiece at the International Lifeboat Conference in a specially built cradle. In 1969, Redcar Borough Council ceased to exist and the residents became part of Teesside County Council. The museum was refurbished and opened with paid attendants in 1969. This only lasted 5 years until the Museum was closed. A 'Save ZETLAND' campaign was launched and it was finally agreed that the museum and lifeboat would be transferred to the RNLI. The RNLI handed back the lease on the Museum on 31st March 2015 and the Museum was taken over by the existing Management Committee and became an Independent Museum. As of 2018 (and following a vessel survey undertaken in April 2014), 'The Friends of Zetland Lifeboat' have now raised sufficient funds to enable them to appoint a boatbuilder to undertake the conservation work the vessel requires. This vessel is listed on the National Small Boat Register https://nmmc.co.uk/explore/databases/ being under 33 feet in length overall. Her record is also held by NHS-UK as a vessel which has been awarded the status of inclusion in the National Historic Fleet, being considered of pre-eminent significance and meeting all criteria for the Fleet other than length.